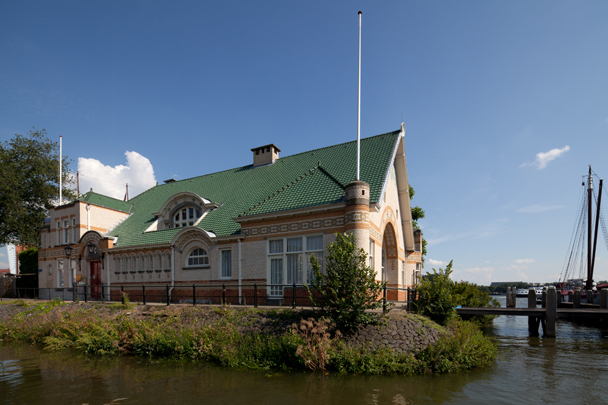 This clubhouse serving the Royal Dutch Rowing and Sailing Club 'De Maas' is where the Rotterdam harbour barons used to converge. Its facades are clad in facing stone interspersed with bands of coloured stone and decorated with multi-tile pictures. The tall roof is overlaid with green glazed tiles. The building once contained a large society room with a vaulted ceiling giving onto a roofed veranda. In the two corners with bay windows there used to be a room for ladies and a room for gentlemen. A third corner contained the boardroom. Hooijkaas was himself a club member. A floating boathouse, a former police post built in 1910, has lain at anchor in the waters of Veerhaven since 2005.